“The Optimist is, quite simply, the dinghy in which the young people of the world learn to sail” (IODAI) . Sailed in over 110 countries by over 150,000 young people, More than 1,500 Optimists have been registered in Ireland (2015). The numbers leave nothing to be said. While younger lighter sailors begin in Optimists, competitive sailors usually weigh between 35 and 55 kg. Optimists, with different cuts of sail, can be sailed by children from age 8 to 15. Due to its inherent stability, unstayed rig, robust construction and relatively small sail, the Optimist can be sailed in winds of up to 30 knots! Easily transported on top of any car, (where it will drip water over your shiny paint- work!). 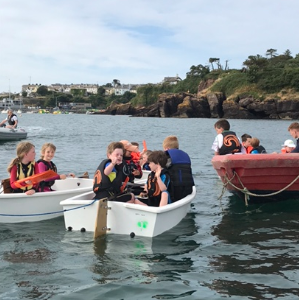 Children as young as 5 have their first experience in an Optimists on our “Sea Legs” program , initially just paddling in the hull without sail present. 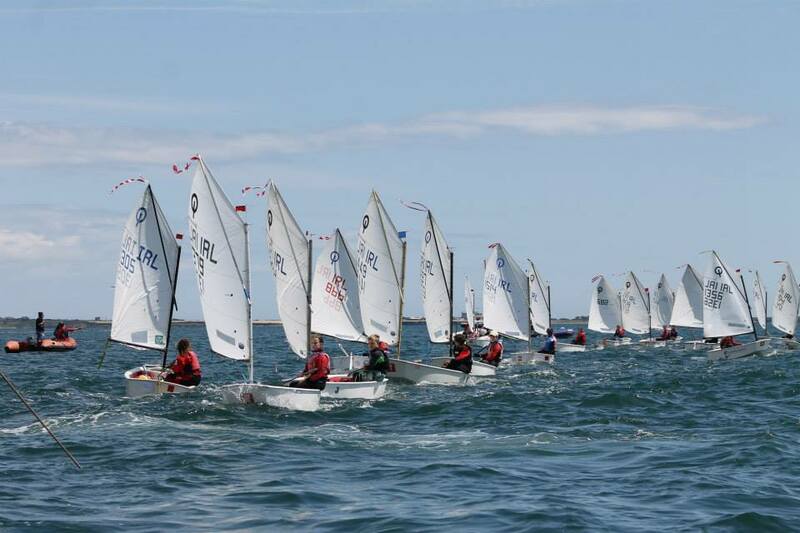 Progression from age 7 is quick however and there is a wide range of club and ISA-accredited Junior sailing courses to choose from. We run regular open sailing, coaching and ‘start to race’ sessions for those who have advanced. 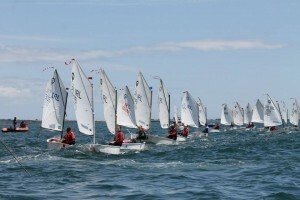 Finally, Optimist sailors can participate in dinghy races on Wednesday evenings and Saturday afternoons in summer months. Almost every year we host an open Optimist event. 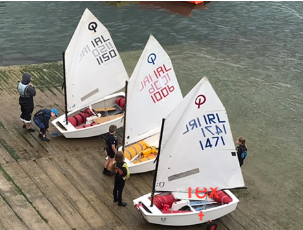 Optimist sailors of all age groups from all over Ireland join us in training and competitive racing with up to 100 participants! A used entry-level boat can be acquired from as little as €500 (and will hold its value!). A nearly-new used competitive racing-ready boat can be acquired for about €2,000 but prices vary widely! We have some club owned boats that may be rented for members’ use. See here for more details. We love introducing children to sailing, a life-long skill. We will be happy to provide both practical advice and encouragement whether you would like to sail, race or even just try sailing a Optimist.